College of DuPage staff and industry experts will be on hand to provide an inside view into some of the most in-demand and cuttingedge careers of today and the future. Come for the knowledge. Stay for the fun! “Authentically YOU” Learn how to trust your potential and find a career that allows you to be authentically you. Also, visit the Disney booth to learn how science, technology, engineering and math are making dreams come true every day. For ADA accommodations, call (630) 942-2141(voice) or (630) 858-9692 (TDD). Please call two weeks in advance. This event is funded pursuant to a grant from the Illinois Community College Board and funded partially through the Carl D. Perkins Career and Technical Education Improvement Act of 2006. ©2019 College of DuPage. All rights reserved. Get lost in wonder Experience natureâ&#x20AC;&#x2122;s wonders at the Peggy Notebaert Nature Museum. Gasp in awe at 1,000 fluttering butterflies. Splash through a river system. Climb into a tree house. Meet live turtles, snakes, frogs, and more. With so much to discover, the Nature Museum is the ideal family adventure, right in the city! 5, of Chicago Photography: Samie Deyo of TK Photography Design: Claire Innes Chicago Parent is published monthly by Wednesday Journal, Inc. POSTMASTER: Send address changes to Chicago Parent, 141 S. Oak Park Ave., Oak Park, IL, 60302. © 2019 Wednesday Journal, Inc. All rights reserved. Let Us Help You Protect Your Relationship With Your Children. Give us a call for a free consultation regarding your family law issues. I am ashamed to admit I neglected the spring cleaning last year. I can’t remember what was going on with the kids a year ago, but I was too busy (or too lazy!) to scrub the house from top to bottom. So this month my focus is all about getting it back to tidy-ish and maybe a little more, such as replacing the kitchen floor and repainting a few rooms. For those of you on top of your spring cleaning, you’ll find some fun, simple ideas for embracing this year’s design TAMARA L. trends and keeping things tidy with O’SHAUGHNESSY messy kids. Of course, all work and no play makes for really unfun parents, so we also have more than 100 ideas of things to do with the kids, including egg hunts galore. Find even more at ChicagoParent.com/egghunts. I hope to see you at our huge Chicago Parent Spring Playdate Character Bash April 28 in Northbrook. It’s going to be super fun with all of the characters, entertainment and activities we have planned for you. Happy April. Discover your capable, confident Montessori child. Children learn best when they’re working with activities they love. At Guidepost, your child will enter the wonderful world of Montessori lessons and learning materials, designed to captivate and inspire. Montessori Spanish Immersion is now available for toddlers through kindergarten-age children. Visit us online today to RSVP for an event or schedule a tour! Grand Opening at Magnificent Mile Campus Saturday, April 6, 10 a.m. to 1 p.m. Here comes Peter Cottontail! Easter marks the time of spring outfits, bunny brunches, egg hunts and more. We’ve put together the ultimate Chicagoland Easter guide for you at ChicagoParent.com/ Easter. If you don’t celebrate the holiday, you’ll find plenty of other fun family events at ChicagoParent. com/weekend—including our Spring Playdate on April 28! Spring cleaning Now’s the time to Marie Kondo your life. Spring cleaning season has begun and as parents, we know it’s not an easy project. We’ve gathered up a list of practical ideas to help you reach those goals. Start organizing at ChicagoParent.com/Clean. Enter to win We’ve got plenty of prizes to give away this month including a package from Miss Mouth’s Messy Eater Stain Treater and movie tickets to “The Missing Link” and “UglyDolls” from Classic Cinemas. Enter our giveaways this month at ChicagoParent.com/Contests. Listen in Have you been listening to our Masters in Parenting podcast? Our latest episodes have covered sleep baby training, saving for college, dental health practices and mom-shaming. Catch up at ChicagoParent. com/Podcast. SHAPING NATIONAL STANDARDS OF CARE Comer Children’s Hospital at the University of Chicago Medicine is ranked among the nation’s best children’s hospitals by U.S. News and World Report. We are shaping national standards of care from infants to young adults. From studying the importance of a healthy microbiome in early development to caring for kids with asthma in our community. From research advancing cancer treatment for adolescents and young adults to focusing on a cure for celiac disease. Personalized care for your child. aving a husband who is also a chef must have been a dream come true for Hillary when she was pregnant. What are some of the things you made for her? We got really lucky in the fact she wanted pasta, and lots of it throughout her pregnancy. I’d do spicy rigatoni with tomato sauce and carbonara. She also craved chicken so I’d find myself roasting whole chickens for her during the week—I felt like Julia Child. She was also really into gelato, and I would bring her gelato by the quart on a nightly basis. I bet you’re looking forward to the day Luka can eat solid foods. How are you going to develop his palette? It’s funny, when my wife got pregnant all I could think about was the meals we’d have together as a family. I want to take him to my favorite places on the South Side, and I want him to experience good food early in life. I can’t wait to take him to farmers markets and cook together. minute, and the next minute I was jumping up and down. It was the most thrilling moment I’ve ever been a part of. Joe Flamm Winner of Top Chef Season 15, Executive Chef at Spiaggia Restaurant Spouse: Hillary Delich Little sous-chef: Luka William, 4 months Baby must haves: Baby Brezza, DockATot and warm blankets in every room, especially after this winter Favorite places to visit as a family: It’s no surprise they are both food related—Beverly Bakery & Café and Cà Phê Dá in Pilsen. We also have a lot of bucket list restaurants for when the weather gets warmer. PLAN YOUR NEXT PARTY or SPECIAL EVENT! during dinner. Go to dinner in groups—all of your friends will want to hold the baby and it’ll take the pressure off you. How has being a dad changed you? Parenthood gives you a new level of respect not only for your parents but for all parents. You begin to look at other parents traveling with kids in the airport and feel empathy for them. It’s also surreal to just be overwhelmed with love for this little person you just met and want to give the world to. What’s the most unexpected thing about parenthood? The instant bond you feel with your child as a dad. You always hear people talk about the connection between a mother and child, but it’s surreal that all of a sudden you meet them and have this intimate connection as well. Luka is my best friend. Customize your theme, time-frame and ﬂow Choose from one of our standard party packages or design your own Either way tell us your plans, set the date & time and leave the rest to us! orthopaedics plastic surgery cleft lip and palate rehabilitation services spinal cord injury The head shape clinic at Shriners Hospitals for Children — Chicago offers effective, non-invasive correction of misshapen or asymetrical heads. Shriners Hospitals for Children — Chicago, offers a broad pediatric plastic surgery service for patients with congenital, developmental and acquired deformities of the face, jaw, head and ears. In addition to surgical services, specialty clinics including a head shape and EarWell™ program bring hope to parents by providing non-invasive interventions that can offer dramatic results. The hopes of families are met in our other areas of expertise as well. For over 90 years, parents and children in need of orthopaedic care, physical rehabilitation, and spinal cord injury care have seen their hopes realized right under our roof — by physicians, nurses, and specialists using the latest technology, innovative research, and a collaborative, family-centered approach. It’s how the Shriners Hospital system has provided care for over 1.3 million children. Ear Reshaping with EarWell* Certain ear deformities are strong candidates for the EarWell program offered at the Chicago Shriners Hospital — another non-surgical approach to patient care that can deliver noticeable results within a matter of weeks. *EarWell is a trademark of Becon Medical, Ltd.
A knock at the door In surviving motherhood, I need to believe I’m right about most things. Getting bogged down with self-doubt is far too time-consuming. Over the MARIANNE years, I have felt somewhat confident WALSH in my methodology. My kids are pretty good (so far). They are decent students (so far). They haven’t committed any felonies (yet). My mission statement has always included steering my kids away from “the bad kid.” Yes, I can be a haughty wench sometimes. “Bad kids” are the ones who swear in kindergarten. The ones who push. The ones who can’t control themselves. A while back, my oldest son, Dan, had an out-of-state hockey tournament. From the beginning of the season, one particular boy made it his life’s purpose to antagonize Dan. For the most part, Dan kept his cool. I quickly assigned “bad kid” status to the boy. As is true in all tournament weekends, the boys spent a lot of time gathering up teammates and congregating in different rooms. Dan assembled such a group and knocked on the door of “the bad kid.” They all hung out together until the wee hours of the morning, eating, joking and re-living hockey highlights and lowlights. I didn’t give the evening another thought until I ran into “the bad kid’s” mom. She thanked me. Her son had certain issues that inhibited his making friends and feeling part of something. “You don’t understand, Marianne. NOBODY has ever knocked on our door until last night.” I choked back a sob. This young man was not a bad kid, but I had certainly been a bad mom in trying to assign standards to him that were medically and physically beyond his control. While it is important to my sanity to feel like I’m not messing up mothering, I appreciated this clear knock on my own door. As I move ahead, I know I have to work harder on not labeling. I need to embrace the unique qualities of all children who cross my path. I need to be less judgey. It won’t always be easy, but I want my family to be the type of people who will knock on someone’s door. It can truly mean the world to the person waiting inside. It’s the Little Family Place with the Nannies Included! FOR SINGLES AND MULTIPLES Our Joy Infant Care has over the years become the recommended and trusted source for finding quality baby nurse and nannies as a reliable referral agency. Our night nurses and night nannies have been professionally trained to care for newborns and educate new and seasonal mothers. I’m told that youngsters can help out around the house. I’ve never seen it happen, but I’m told it’s a thing. MATT BORESI Perhaps I wasn’t required to help out enough when I was growing up. Perhaps it’s easier to just do things myself. Perhaps I’m actively cultivating a monster, but I don’t ask much of my daughter, Viva. According to most experts, there’s plenty a child can do. Even 2- to 3-year-olds can allegedly pick up their toys and wipe up spills, though I was happy enough during those years if toys weren’t thrown at my head and smoothies weren’t poured directly on the couch. By ILLUSTRATION BY STEPHEN SCHUDLICH 7, a child can allegedly sweep, make a bed and pick out their own outfits. Left to do those things herself, Viva will turn the sweeping into a Quidditch match, the bed into a fort and the outfits would be ball gowns every day at school. With both my wife and I working in the arts, chores around our house can be different than in other families. “Sweep up the sequins” is pretty common, as is, “File the libretti by draft date,” and of course there is always, “Validate us with applause.” I guess our daughter is pretty good at all of these. I named her “Viva Boresi” for a reason. When I do ask for more challenging chores to be done, Viva runs a pretty effective scam. She asks, “Can’t you help me, Daddy?” while batting her big brown eyes (and knowing I’m pretty obtuse). By the time I realize she’s been watching She-Ra instead of helping, I’ve already cleaned up all the toys and hung up all the costumes. I suppose it’s time I up my expectations for work around the house. It comes with a price, though. Little hands setting the table means searching for matching Fiestaware to replace what’s been dropped. Little arms mopping means a flooded room, and little minds organizing clothes means… well, at 7 she can probably organize a drawer better than I can, so there’s that. I’ll see what I can do to ask for more help around the house, but, really, can’t all these chores just wait until she goes to college? We’ve got playing to do. Viva Housework. Viva Viva. Viva Daddy. Viva is 7 years old. Daddy is about 6x that age. They live happily with Mommy in Chicago. lthough I love heading to the spa or for a blowout as much as the next gal, time and funds don’t permit this to happen more than a few times per year. Fortunately, at-home tools and products have come a long way, baby—you can get fairly professional results without leaving your boudoir. Here are a few of my tried and tested favorites from years of research, all available for a fraction of the cost of hitting up the spa or salon. I can count on one hand the times I have had a professional blowout. I love it for a special occasion, but I can’t fathom regularly paying $50+ for something that washes out the next day. My friend Elise of the blog Belle Meets World Don’t confuse this procedure introduced me to the Revlon One-Step Volumizer with shaving! Dermaplaning Hair Dryer. At just under $60, I was skeptical is a skincare treatment that that this blow dryer/round brush combo could removes vellus hair (aka peach deliver a sleek, professional-looking blowout, fuzz) while Spring is a time that I focus on but I was an instant convert after one use. clearing my skin. A professional pore-clearing Bonus: it works so well on my 5-yeardead skin facial costs at least $60. I received a old’s hair, who never lets me use a cells from GlamGlow product in one of my makeup real blow dryer but doesn’t the surface of subscription boxes and was shocked mind this tool. your skin. I have that I could actually FEEL it working. The had two professional SUPERMUD Clearing Treatment is the perfect dermaplane sessions and my spring cleaning product for your skin NEVER looked better. I was face, it also smooths texture introduced to DERMAFLASH, an and brightens in addition at-home dermaplaning system. It to sucking gunk from your takes less than 10 minutes, and pores. The L’Oreal Detox I am always shocked at how smooth and glowing & Brighten Clay Mask my skin is after using it. Added bonuses: Skincare comes in a close second at products are absorbed easier and makeup glides on a fraction of the price. like silk. Spring Sports Thrills • Character Visits • Bounce Houses Train RidesObstacle Courses • Entertainment Stage all ages welcome! Sunday, April 28 • 10 a.m. 3 p.m. 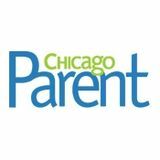 Discover Chicago Parent Marketplace! Shop at a dozen small retailer booths as part of the fun! Thanks to our Sponsors! Working with children birth to adolescence. Visit ChicagoParent.com/playdate for advance tickets and info! Be the future See it. Touch it. Make it. ake your spring break far from ordinary with a trip (or two) to the Museum of Science and Industry for a sneak peek of the creative mashup of technology and fashion that will unleash the maker in you. From an awesome glitter cannon prosthetic to an amazing jet suit, Wired to Wear, the first-ever exhibition dedicated to the future of wearable technology, shows off the possibilities of clothing that will make us healthier, stronger and smarter in the not-too-distant future. Then, in true MSI spirit, channel all of that inspiration, roll up your sleeves and enter Chicago’s newest hands-on maker experience, Makers United, to build your own piece of wearable technology. “It’s taking all the best of technology and making it close up and personal,” says Kathleen McCarthy, director of collections and one of the leaders on the Wired to Wear project. Get inspired. See the endless possibilities of 3D printing just like child maker Jordan Reeves, who was born without the lower part of her left arm. Determined to change attitudes about physical differences, she created the most amazing prosthetic, a glitter cannon made from a 3D printer. Really feel that spidey pidey sense. Using technology created by Chicagoan Victor Matseevitsi, try on a SpiderSense vest that helps people with low vision navigate their surroundings. Look to the skies. We’ve all been imagining personal jet suits forever, so how long will it be before we all get one? Gravity Industries’ Jet Suit moves us so much closer, showing how easy it is to fly. Create something. Yes, you CAN be a maker! At Makers United, facilitators will teach kids, moms, dads and grandparents about circuit building, then everyone gets to build their own wearable LED band. “We want people to get home and keep iterating on what they built so they can understand their own potential to impact the future of wearable technology,” says Manny Juarez, MSI’s director of science and integrated strategies. 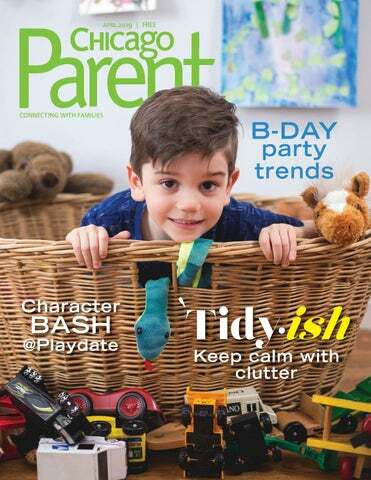 Tidy tips all parents can tackle even on busy, messy days Our cover boy, Jasper Schoeny, 5, of Chicago, loves making messes. t’s the eternal struggle of parenting little ones: You want them to play (and play independently at that), but the constant battle over misplaced and disorganized toys can make even the most zen parent lose their shanti. Here are a few tips to keep kiddo clutter at bay while riding the occasionally rough waves of parenthood. Truth time, now. How do you feel when your shoes and coats and paperwork cover every available surface? Overwhelmed, right? Less really can be more when it comes to creating stress-free zones for our kids. Empty out the playroom into gigantic piles and let them help cull broken and unused things, giving guidelines like “We have 15 big trucks, let’s find two to share.” (Does this process take 80 times longer than doing it yourself during school or nap time? Probably. But does it instill good habits that will hopefully last into their own adulthoods? Absolutely.) Encourage them to choose a charity or organization close to your family’s heart to donate to, and talk about how some things your kid simply likes can turn into something another kid will love (and maybe even need). And don’t discount the Big Kid ego boost of hand-delivering outgrown items to a neighborhood little one. Philanthropy can start young! blocking books and knick knacks is a great way to define a space—and is highly Instagrammable, too. Kick out the monsters from under their beds Don’t be afraid to check out what’s going on under the bed! Yes, this spot can become a dark abyss when left without hard n’ fast rules, but this terrific real estate is prime for those long rolling bins that usually hold guest room bedding, off-season sweaters and the like. Have a crazy collection of doll clothes? Tracks and building sets and tall marble runs and floor-sized puzzles? You know what to do. trash bags for this one!) This storage hack is great if seating is an issue on playdates, and the refilling of the bags with soft friends is an absolutely perfect chore for the youngest members of the family to understand. - NinjaCamp for ages 6-12 - Self-Defense Strategies in 12-weeks - Grow your Confidence this Spring! Think outside the toy bin If you’re looking to create welldefined spaces for your kids’ collections but can’t bear any more licensed character faces plastered on polyester, go treasure-hunting around the house. Magnetic knife strips are practically begging to hold a racetrack’s worth of tiny metal cars, and heavy-duty milk crates can be stacked or secured to the wall for virtually indestructible shelving. Got a bevy of unused mason jars from a planned Pinterest project? (No judgment, here.) Those look exceptional grouped together when they store vibrant collections of marbles, beads, colored pencils…or whatever it is your preschooler just emptied from his pockets and wants to keep forever. u To check out more Tidyish tips, head to tidyish.com and follow along on Instagram at @tidyishkeely. down” bins. A cute box or basket is placed by the side door, tucked next to the landing step, and anywhere else that receives higher-than-normal traffic. Yep, these are our clutter drop zones. Perfect for when you’re running late or running on empty, it’s an forgivable cheat to toss an item that needs to eventually live in another room or floor. The only catch? When it’s full, items have to be delivered around the house as soon as possible. (My firstgrader takes immense pride when she’s a delivery person, but maybe the perk of whatever change is in my pocket sweetens the deal a little.) Happy sorting—and an even happier play time! Keely Flynn is a Chicago Parent writer and blogger who created a company to help real parents keep their homes tidy and organized. illennials hate us. I need you.” I grew up with Nancy. Our relationship has long been free of standard pleasantries and conventions. It didn’t surprise me to be ushered into a conversation with her via this plea. Her urgency concerned me, though. Pre-K through Grade 8 Sign up for an Open House or schedule your Private Tour today! impress birth parents. We want them to see that we’re like them. We understand them. We’re all in different parts of the same boat—wondering how we got here and trying to make the best of this unexpected situation we find ourselves in.” Getting our approach down was step one. There were a lot of required elements. Incorporating those was the easy part. Sometimes I felt like Nancy and I were back in junior high hanging out in her bedroom, doing a school project or making posters for an event. Our collaboration was familiar but refined. I was fascinated by the executive and the academic Nancy has become—her professional side is one I glimpse, but I was so impressed to have the chance to really see. Our final product was honest, genuine, tangible. It’s the only adoption profile I will ever write. The process is too emotional, taxing and high stakes. Once Nancy submitted the revision, she immediately got two inquiries. They didn’t go anywhere, but I was relieved that our work was at least turning heads. Then the attention dried up. Nothing for months. I worried and hoped. Then Nancy and Paul learned that a couple wanted to meet them, and things progressed quickly. Several weeks ago, I met Miss Natalie—the perfect addition to their family. Natalie is calm and gentle. She smiles all the time. One of the most amazing things about her is how she connects with her brother. They light each other up. When you look at these kids you can clearly see that they are siblings. Adoption has its own magic. It works at its own pace. It has its own pain, and a spectacular, hard-earned beauty. I’m in awe of the process in which I was invited to share. I learned so much about the families we make and the families that make us. ing, dance and play with fave princesses, superheroes, mascots and characters April 28 at our annual Spring Playdate. with CircEsteem and Budda Belly Yoga, the contagious high-energy dance fun of The Happiness Club and sing-alongs with Mary Macaroni. The minature therapy horses from Mane in Heaven even stop by for a visit. Plus, we’ll have tons of hands-on activities for kids and info for parents from our trusted advertisers. OME AND JOIN US FOR OUR ANNUAL “MEET THE HORSE” OPEN HOUSE ON SATURDAY, MAY 4, 2019 10:00 a.m. to 2:00 p.m. * Admission: $5.00 per person * Pony rides, mini-lessons, grooming, leading, demonstrations, driving, photo ops and more! Learn about our riding lessons and summer camps....learn how to ride for pleasure and show! most professional instruction in the area. Embrace color. Whether bringing in color as an accent or making a big statement with a lot of color, your home will feel instantly transformed and personalized. I always suggest going with whatever color or colors are most pleasing to you, but some big color trends this spring are oranges, pinks, sage green and pastel blue. 2 “Like most mothers, whether they’re working or staying at home, we do what we can.” offering a female perspective that better reflects the company, the industry and the country today. “When I first came on board, our industry was very much a good old boys club,” says Maureen, who regularly travels to marketplaces around the country to buy merchandise. “It’s no longer that way.” The sisters get together at least twice a week, traveling from their homes in Chicago, Barrington and Riverside, leaving behind their children, husbands and home duties. “We’re not trying to portray an image that working mothers can pull off everything without something falling through,” Maureen says candidly. “It’s unjust to think that women can somehow balance it all,” Colleen adds. “There is no true balance for moms in our situation.” “We can’t be everything all at once,” Meghan says. “It takes work and sacrifice.” For example, Meghan had to miss her son’s Valentine’s Day party at school this year, due to work responsibilities. To make up for it, she woke up early to make heartshaped pancakes. Texture, texture, texture! Bringing new and various textures into a room can take it from plain and lacking in interest to exciting and memorable. Some ways to do this include mixing fabrics and leathers such as pairing linens with velvets, shag rugs, fur throws, organic elements such as rattan and bamboo… even the reflectiveness of chrome can add texture to a room! Mix away! Don’t burden yourself with the boredom of a matching wood set. Mix together different, but complimentary, elements such as woods, metals and stones…and feel free to mix various metals together. There is no rule book that says they all need to match—metals always compliment one another. Go for the unexpected. I love incorporating an unexpected element into a room. There are so many cool and unique materials being used to manufacture furniture these days—such as capiz shells, bone inlay, faux shagreen, concrete, rope and slate. Jerry Davich is a Chicago-area writer and dad. o matter how many times we vow that this year we will throw a low-key, more-affordable birthday party for our little one, it’s way too easy to get sucked in that black hole of Pinterest. Take it from the mom who spent countless hours bringing the “Bubble Guppies” theme to life with homemade clam shell cookies served in actual fishbowls, on a bed of coral reef rock candy. Because we know you’ll probably give in, too, here’s a glimpse of what’s trending in birthday parties this year. Whether you’re throwing a first birthday party or one for an older kiddo, these are all fairly attainable ideas that’ll make their celebrations even more memorable. time now, and more kids are requesting this theme for their big day. While it seems to be a lot of planning for the host parents, the theme is a pretty proven way to tire out the kids. TOY-SHARING SUBSCRIPTIONS AS GIFTS When my kids get a new toy, it becomes the shining star for a few days, and then it goes in the back of the closet to die and never be played with again. The toy sharing subscription model lets families eliminate the clutter by borrowing toys and then returning them. While only a handful of companies cater to this need, Toy Library is the most popular. Trying out any of these ideas? Share them to our Facebook and Instagram @ChicagoParent #sharechicagoparent! DECORATION FOR ANY OCCASION Ellis Illusions works to craft unique and flawlessly executed events for all of Chicagoland. With a focus on creativity, flexibility, and attention to detail, we help our clients plan events that consistently exceed expectations. Pick a theme and leave the detail to us. age includes a personal party host and coach to ensure a fun and organized party. THE A’S CLUB Why kids love parties at The A’s Club: Our interactive Fun Coordinators and our focus on group play. A single party/ event could include network play of the latest video games on state-of-the art equipment, followed by an obstacle course run, games, dancing, sing it out with a friend on the karaoke machine and a slime or Play-Doh session. Why parents love parties at The A’s Club: It’s safe, clean, and most importantly focused on extraordinary customer service. When we host parties, the parents do not have to lift a single finger once they are in the facility. special advertising section // Duncan suggests giving guests the opportunity to become authors by having them create a new book. Give kids blank books (available at craft stores) and have them write and illustrate a new story with crayons and stickers. Need help or ideas for other activities? Head to the local library and ask the children’s librarian for suggestions. children to wear when reading the book, such as a hat to go with a Curious George, The Cat in the Hat or Madeline or crowns to go with royal titles. A cake featuring the main character of the book is always a good idea, and you don’t have to look far for decoration inspiration. Stick with the colors on the cover of the book and be sure to use books themselves. READING IS FUNDAMENTAL While the focus should be on the fun, there’s the added benefit of promoting reading among little ones. “Book-based birthday parties are an exciting way for children to be introduced to new characters or a new series they may not have heard of before, or they can revive a love of reading through the excitement of a friend’s party,” says Glaser. Guided Trail Rides for Children & Adults! Chicago’s only local magazine and resource guide to life for families who have children with special needs. 2019 digital edition now available! 701 W. North Ave., Villa Park 630•530•4649 | safarilandfun.com Buy a $15 wristband - for only $10! Custom parties featuring hands-on circus instruction! oodie bags, the fun finale to a kids’ birthday party, are good by definition, but some are better than others. A great goodie bag can guarantee you end a birthday party on a high note and guests leave with full hearts. Here are some tips for assembling ones that will delight both parents and young party goers. ent. Find one that matches the party theme. If you want to involve the birthday child, have them create bookmarks for each guest. Muszynski got rave reviews for giving water bottles attached to carabineers at her daughter’s climbing party. Kids are still using them and remembering the fun day months later. 2 FREE PIZZAS (Adult Size) When you book any Monday-Thursday Party Package for 25 Valid at these locations only. May not be combined with other offers or promotional discounts. One coupon per customer. Expires 12/31/19. Open Jump Admission Check the Events Calendar at pumpitupparty.com for available jump times. Valid for one Open Jump session at these locations only. May not be combined with other offers or promotional discounts. One coupon per customer. Expires 12/31/19. Fully customizable circus party includes warm-up games, an exciting demonstration of skills, a circus workshop with hands-on instruction, and 30 minutes for food, dessert and presents. and STEM celebration! Explore technology with your friends including programming games, robots, VR, circuits, 3D printing drones and more! A party to remember! Guests use their imaginations to create fantastical characters, sing and dance to popular songs, and even write their own story together! Celebrating almost 60 Years of Family Fun! Visit our website for birthday and private party packages! Come party on the best skating floor around! Musical, educational fun filled interactive puppet shows for children. Reserve now and save an extra $25 off your order. Use coupon code: Chicago Parent. Serving greater Chicago and Suburbs. Huge selection of equipment and games to make your event successful! New table games and interactives! Check out the website to see videos! Little Gym gives your birthday kid and their friends the full run of the facility, filling the celebration with instructor-led games, music, and fun. Featuring two full floors of games, laser tag and rides. Several different party packages at affordable rates, all include private party coordinator for stress-free fun! The nation’s #1 indoor inflatable party place. Giant inflatables in your own private arenas and private party room exclusively for your child and guests! Great Birthday Celebrations Without the Work! queen of the jungle! Celebrate your next birthday with the Wild Bunch and you’ll enjoy the royal treatment. Pony parties, pony rides and pony rentals are great for any special occasion, including children’s birthday parties. We make it memerable! Check out our parties featuring the arts, ice skating, history, nature, minigolf, our gymnasium, as well as parties at the renowned Exploritorium! PARTY WITH US! BOOK TODAY! Princess & Character Parties Magic • Clowning Guitar Sing-a-Longs Face Painting & Balloons! Providing Quality, Professional Entertainment since 1991 Several Themed Characters available. Video clips and party ideas are provided on the website. Spring Sunday, April 28 • 10 a.m. 3 p.m.
Visit ChicagoParent.com/playdate for advance tickets and info! Working with children birth to adolescence. Therapeutic summer camp for ages 4-10. At iD Tech Camps, students ages 7-17 can learn to code, design video games and more. Featuring two full floors of games, laser tag and rides. The nation’s #1 indoor inflatable party place. April 8, 10 a.m. - 5 p.m., April 9, 10 a.m. - 4 p.m. $11, $8 kids 3-11, under 3 free. Celebrating 60 Years of Family Fun! Best skating floor around! huge selection of equipment and games to make camp a blast! Please visit us on On YouTube you can view parents and campers talking about their experiences at Lee Mar. Please visit us on On YouTube you can view parents and campers talking their experiences at Lee Mar. Please visit us on On YouTube youabout can view parents and campers talking about their experiences at Lee Mar. Friday, April 12, 2019 ~ 8 am to 3 pm Register by April 5th to spend the day at Res! Were you showing your kids “Return of the Jedi” during ing late-night feedings at 3 months old? Did they learn their A-B-Cs as A iss for Anakin, B is for BB-8, C is for or Chewbacca? Does your 5-yearold already have his own Jedi uniform? Even if that family is your neighbor and not you, ve you’ll still find something to love rat Star Wars Celebration. The fourday convention is an experiencee for fans of the movies and brings gs in families from even far, far away. y. Kids will love pin trading, the fan-produced oduced game shows and more. $35-$75, 5, April 11-15. McCormick Place, 2301 S. King Drive, Chicago. starwarscelebration.com. Earth Day isn’t just a celebration for the planet, at Brookfield Zoo, it’s a party. Kids can help plant trees and flowers, learn about recycling and parents can pick up free stuff to make their homes more eco-friendly at Party for the Planet. Zoo residents are prepped for special zoo chats and kids can try their hands at green-themed crafts. Free with zoo admission, 10 a.m.-4 p.m. April 14. Brookfield Zoo, 8400 31st St., Brookfield. czs.org. Having kids doesn’t mean that the college CD collection has to head to the attic. The music of Phish, the Rolling Stones and Grateful Dead get a renovation for a new generation through The Rock and Roll Playhouse. Thalia Hall hosts events through June, with Prince taking the spotlight in April. Recommended for kids 10 and under, there are games, stories and rock-it-out moments based on the artist of the day. $15, free under 1, 11 a.m. April 14. Thalia Hall, 1807 S. Allport St., Chicago. therockandrollplayhouse.com. with CPS days off, through acting games and exercises, students will create unique characters that will be used to create a short play at the end of the day. Pack a lunch, a water bottle and two small snacks to bring to camp. $80 and up. 8 a.m.-4 p.m. (presentation for parents from 3:30-4 p.m.) Today’s camp: Folk Tales Camp. Stage 773, 1225 W. Belmont Ave., Chicago. (773) 3275252. stage773.com. SECOND CITY ONE-DAY CAMP. Spend the day off from school at The Second City in the improv and comedy writing one-day camps. No previous experience required. Recommended for ages 8-18, students are grouped by age. $100. 9 a.m.-5 p.m. Second City, 1616 N. Wells St., Chicago. (312) 337-3992, secondcity.com. children’s books read aloud and performed by actors from the Theatre Y Ensemble. Recommended for ages 6 and under. 10 a.m. The Ready, 4546 N. Western Ave. theatre-y.com. provided. Today’s workshop: Birds & Pom Poms. $60. 10 a.m.-noon. The Wishcraft Workshop, 3907 N. Damen Ave. (773) 348-9474, wishcraftworkshop.com. $25. 5:30-8 p.m. Power Up Tech Academy, 2867 N. Clybourn Ave. (312) 659-3082, powerupTA.com. Learn about the ape species that live in the zoo’s Tropic World: orangutans, western lowland gorillas, and white-cheeked gibbons. The event features special Zoo Chats as well as ape-related activities. Free with zoo admission. 10 a.m.-5 p.m. Brookfield Zoo, 8400 31st St., Brookfield. (708) 688-8000, czs.org. Children of all ages and parents can try hands-on STEAM activities inspired by the interdisciplinary ideals of the Bauhaus. Free with museum admission. 1-4 p.m. Elmhurst Art Museum, 150 S. Cottage Hill Ave., Elmhurst. (630) 834-0202, elmhurstartmuseum.org. night for kids 7-12 to play and meet other fans of the game. Each party is a supervised session of open play time, where kids may join private servers set up for the evening or play on public servers of their choice. About the calendar The deadline for submitting listings for the May issue is March 25. All events are subject to change. Please call the event sponsor at the number listed to confirm before you go. Events taking place on four or more dates during the month are listed in Ongoing Events, beginning on page 51.
commemorate the day, the zoo’s iconic lion statues will be clothed in blue scarves. Throughout the day, special activities take place for families with children on the autism spectrum. These include a “quiet hour” on the Carousel, a sensory-friendly Dolphins in Action presentation, and special animal Zoo Chats. Free with zoo admission. 10 a.m.-5 p.m. Brookfield Zoo, 8400 31st St., Brookfield. (708) 688-8000, czs.org. CHUG CHUG CHUGGIN’ ALONG. Division of the National Model Train Association. $11. 11 a.m.-3 p.m. Discovery Center Museum, 711 N. Main St., Rockford. (815) 963-6769, discoverycentermuseum.org. to sing, dance, read books and make crafts with Agent Zach and your friends, parents and siblings. Recommended for junior agents ages 0-4 and their families. 11 a.m.-noon. The Wicker Park Secret Agent Supply Co., 1276 N. Milwaukee Ave. secretagentsupply.com. plus hands-on art activities and entertainment throughout the day. 11 a.m.-3 p.m. Barrington High School, 616 W. Main St., Barrington. barringtonchamber.com. guardians & caregivers of high school students with autism are invited to meet other families, talk about life transitions, get help & advice, and hear & share stories. 5:30-7 p.m. Higgins Education Center, 1030 W. Higgins Road, Hoffman Estates. adc.d211.org. 11 | THURSDAY STAR WARS CELEBRATION. to age 8 with special needs. They are welcome to stay when the museum opens to the public at 10 a.m. $5 per person. 9-10 a.m. Wonder Works Children’s Museum, 6445 W. North Ave., Oak Park. wonder-works.org. in workshops, open studio sessions, gallery tours, and performances, all designed and led by Chicago artists. Families with kids 12 and under. 11 a.m.-3 p.m. Museum of Contemporary Art, 220 E. Chicago Ave. (312) 280-2660, mcachicago.org. 5-12 and parents have a chance to dig into a simulated excavation while learning about the real science of archaeology. This program includes an interactive guided tour of the galleries. $10-$14; registration required. 1-3 p.m. Oriental Institute Museum, 1155 E. 58th St. (773) 702-9514, oi.uchicago.edu. and explore Spring Valley to find spring surprises. Recommended for ages 4-7. $12, $8 residents. 1-3 p.m. Spring Valley Nature Center & Heritage Farm, 1111 E. Schaumburg Road, Schaumburg. (847) 985-2100, parkfun.com. April 11. ROCK & ROLL FOR KIDS. Using the songs created by the most iconic musicians in rock history, The Rock and Roll Playhouse offers games, movement, stories and an opportunity to rock out. Today’s artist: Prince. $15. 11 a.m. Thalia Hall, 1807 S. Allport St. therockandrollplayhouse.com. the animals at special Zoo Chats. Free with zoo admission. 10 a.m.-4 p.m. Brookfield Zoo, 8400 31st St., Brookfield. (708) 688-8000, czs.org. hunt in a historic building. Kids enjoy the use of shared iPads, which show historic images that illuminate life in the late 19th century. $28, $18 17 and under. 11 a.m. Congress Plaza Hotel, 520 S. Michigan, Chicago. chicagodetours.com. Rolek Community Center, 814 Hart Road, Round Lake. rlapd.org. the membership organization for Chicago-area ensembles, artists, composers, students, and advocates of contemporary music, will play a contemporary concert. Noon-12:45 p.m. Chicago Cultural Center, 78 E. Washington St., Chicago. (312) 7446630, newmusicchicago.org. 1893 WORLD’S FAIR WALKING TOUR FOR FAMILIES. See April 15. PLAY IN A DAY. See April 5. Today’s theme: Heroes & Villains. 17 | WEDNESDAY PLAY IN A DAY. See April 5. Today’s theme: Dragons & Fairies. April 15. 1893 WORLD’S FAIR WALKING TOUR FOR FAMILIES. See April 15.
a true princess while playing games, crafts, songs and playtime on the mats. Wear favorite princess pajamas to class. Recommended for ages 3 1/2-7. $18, $12 residents. 6:157:15 p.m. Community Recreation Center, 505 N. Springinsguth Road, Schaumburg. (847) 490-7020, parkfun.com. 15. PAPER MAKING AND DESIGN. Create and design bookmarks, journals and note cards by reusing paper. Recommended for ages 6-12. $7, $5 resident. 4-5 p.m. Robert W.
Shlesinger has a book, an album and specials on Netflix. The first female and youngest comedian to hold the title of “Last Comic Standing” brings her show to Chicago. Recommended for adults only. $59+. 8-10 p.m. Chicago Theatre, 175 N. State St., Chicago. (312) 902-1500, thechicagotheatre.com. 15. TASTE OF FRANCE CAMP (LATE ELEMENTARY/MIDDLE SCHOOL). The Ultimate Guide to Family Fun! Day with kids’ crafts and games, puppet shows at 11:15 a.m. and 1:45 p.m., guided nature hikes at 12:15 p.m. and 3 p.m., and help restore a habitat. Fee for large recycling items. 11 a.m.-4 p.m. Prairieview Education Center, 2112 Behan Road, Crystal Lake. (815) 479-5779, mccdistrict.org. will learn to make Bunny Cupcakes complete with pink ears and a bright shiny nose. This class is designed for kids and parents to cook together. $30 per child with one caregiver included; preregistration required. 9-10 a.m. Taste Buds Kitchen, 2521 Waukegan Road, Bannockburn. (847) 230-0330, tastebudskitchen. com/bannockburn. EARTH DAY. Celebrate Earth Day with hikes, puppet shows, artmaking and Earth Day Jeopardy. 10 a.m.-3 p.m. Sand Ridge Nature Center, 15891 Paxton Ave., South Holland. (708) 868-0606, fpdcc. com. Crabtree Nature Center with mud and mural painting, crafts, giant basket weaving, animal encounters and outdoor play. Noon-3 p.m. Crabtree Nature Center, 3 Stover Road, Barrington. (847) 381-6592, fpdcc.com. The University of Minnesota is seeking women who are currently less than 20 weeks pregnant to participate in a research study examining the effect of exercise and wellness on mood following childbirth. To see if you qualify for this research study: English Speaking: Call or TEXT to 612-345-0325 or mompro@umn.edu. CALENDAR 6-10. $20. 10 a.m.-noon. Heller Nature Center, 2821 Ridge Road, Highland Park. (847) 433-6901, hellernaturecenter.org. EARTH DAY CELEBRATION AND PRESERVES CLEAN UP. Clean up the preserves in partnership with Friends of the Parks in the morning, and then afterward celebrate with fun nature activities and snacks. 9 a.m.-1 p.m. Beaubien Woods Forest Preserve. 13400 S. Doty Ave. (708) 3864042, fpdcc.com. Garden looking for life right below the surface of the soil. Meet in the garden located behind the Nature Center. 4-5 p.m. Spring Valley Nature Center & Heritage Farm, 1111 E. Schaumburg Road, Schaumburg. (847) 985-2100, parkfun.com. schedule: 10 a.m.-7 p.m. live music, a gourmet market, and more. $12 adults, free 12 and under; once purchased, tickets are good Friday-Sunday. 11 a.m.-8 p.m. The Merchandise Mart, 222. W. Merchandise Mart Plaza #470, Chicago. oneofakindshowchicago. com. FRIDAY FUN. Enjoy play time with the Children’s Neighborhood Museum learning about planes, trains and autos. Recommended for ages 1-6. $13, $12 residents. 9:30-11 a.m. Robert W. Roles Community Center, 814 Hart Road, Round Lake. rlapd.org. CALENDAR recommended. 1-3 p.m. Oriental Institute Museum, 1155 E. 58th St. (773) 702-9514, oi.uchicago.edu. ages can make projects—construct a kimono-clad paper doll, create a miniature carp kite, design a hanging scroll, and more, at familyfriendly, hands-on stations. Free with museum admission. 10 a.m.-3 p.m. Chicago Botanic Garden, 1000 Lake Cook Road, Glencoe. (847) 835-5440, chicagobotanic.org. EARTH DAY/ARBOR DAY. about the zoo’s Humboldt penguin colonies, partake in penguinthemed activities and crafts, and meet a few of the fine-feathered birds up close. Free with zoo admission. 10 a.m.-3 p.m. Brookfield Zoo, 8400 31st St., Brookfield. (708) 688-8000, czs.org. SING ALONG WITH THOMAS. Chime in on your favorite fun train tunes, learn classic folk songs, and even practice the locomotion. Free or discounted admission if your share a name with Thomas or one of his friends. $11. 10:45 a.m., 11:45 a.m. & 12:45 p.m. Discovery Center Museum, 711 N. Main St., Rockford. (815) 963-6769, discoverycentermuseum.org. EARTH DAY. Stations will be set up for kids to repurpose small items for a gift. Dress to get messy. Those who bring two recycled items to reuse will be offered a giveaway. 11 a.m.-12:30 p.m. Prairie Grass Nature Museum, 860 Hart Road, Round Lake. rlapd.org. EARTH DAY FAIR. Parents can learn green living tips and energy-saving info while kids participate in children’s activities. Eco-friendly vendors will also discuss the benefit of trees and residents can order a rain barrel or composter. 1-4 p.m. Fort Hill Activity Center, 20 Fort Hill Drive, Naperville. napervilleparks.org. (preschool for ages 3 to 5 years)– Daycare subsidies accepted! your superhero for a super afternoon of games, crafts, snacks and fighting off evil-doers. Recommended for ages 2-9. $12, $9 in advance 2-3:30 p.m. Eola Community Center, 555 S. Eola Road, Aurora. (630) 851-8990, foxvalleyparkdistrict.org. Kids ages 6-12 will prepare for Star Wars Day through a series of physical and mental challenges to earn their official Jedi Training Academy completion certificate. Snacks and drinks will be served. $12. 2-3:30 p.m. Vaughan Athletic Center, 2121 W. Indian Trail, Aurora. foxvalleyparkdistrict.org. CALENDAR FAMILY NIGHT OUT. An evening of play and learning for children with special needs and their families, focusing on autism spectrum and other sensory processing disorders as well as physical disabilities. Registration required. 5:30-8 p.m. DuPage Children’s Museum, 301 N. Washington St., Naperville. (630) 637-8000, dupagechildrensmuseum.org. Enjoy character visits, sports, bounce houses, music, train rides, obstacle courses, activities at every table and more. $8 kids 4-14; $4 kids 2-3, $2.50 kids under 2; free adults. 10 a.m.-3 p.m. Athletico Center, 1900 Old Willow Road, Northbrook. (224) 326-2061. chicagoparent.com/ playdate. MALOTT JAPANESE GARDEN SUMMER FESTIVAL. See April 27. This year’s Earth Day celebration features games, activities, food and a native plant sale. Noon-4 p.m. Emily Oaks Nature Center, 4650 Brummel St., Skokie. (847) 6777001, skokieparks.org. EARTH DAY PARTY. wildflower seedlings, birdhouse building, worm composting construction, a live hawk and owl display, and more. Noon-4 p.m. Spring Valley Nature Center & Heritage Farm, 1111 E. Schaumburg Road, Schaumburg. (847) 985-2100, parkfun.com. but also help them to gain confidence, express themsel more fully, and work patiently and themselves respectfully with each other. CALL 773-761-4477 or visit www.lifelinetheatre.com to register your child today! ONGOING EVENTS EXHIBITS AMPLIFIED CHICAGO BLUES. world of Daniel Tiger and friends to explore the Neighborhood. Free with museum admission. DuPage Children’s Museum, 301 N. Washington St., Naperville. (630) 637-8000, dupagechildrens museum.org. HOLD A BABY LAMB. The farm is open weekends in April and May for holding baby lambs, goats, chicks, piglets and feeding the calf. $6 each; $30 total for families of six or more. 9 a.m.-3 p.m. weekends. Pioneer Farm, 17N400 Big Timber Road, Hampshire. (847) 683-2863, enjoypioneerfarm.com. invites visitors to walk through a winding gallery that features more than 25 photographs depicting key moments in Dr. King’s work and the Civil Rights movement. Free with museum admission. Chicago History Museum, 1601 N. Clark St., Chicago. (312) 642-4600, chicagohistory.org. Island of Sodor, load luggage onto train cars and load Percy’s coal box and fill his tank with water from a tower. $11, $3 museum members. Discovery Center Museum, 711 N. Main St., Rockford. (815) 963-6769, discoverycentermuseum.org. UNDERWATER BEAUTY. Get a glimpse of the grandeur beneath the waves as 100 species from around the world come together. Free with admission. Shedd Aquarium, 1200 S. Lake Shore Drive, Chicago. (312) 939-2438, sheddaquarium.org. large treehouses, encounter wildlife of all sizes, dance to a forest-sound symphony and more. Included with admission, $9 for adults, $7 for students and seniors, $6 for children 3-12. Thursdays are free for Illinois residents. 9 a.m.-5 p.m. Monday-Friday, 10 a.m.-5 p.m. Saturday-Sunday. Peggy Notebaert Nature Museum, 2430 N. Cannon Drive, Chicago. (773) 7555100, naturemuseum.org. up-close and hands-on with one of those critters and learn about animal friends that live at the nature museum. Free with admission. Noon daily. Peggy Notebaert Nature Museum, 2430 N. Cannon Drive, Chicago. (773) 755-5100, naturemuseum.org. in the studio for themed stations to introduce you to architecture basics, a design challenge and a take-home project. Family Build is great for families with children ages 3 and up. $12, free members. 10 a.m. Sundays. ONGOING EVENTS years to meet others with young children. Share experiences, ideas, and concerns with others and staff whose skills are in family and child development. $25 per family. 1:30-3 p.m. Mondays. Virginia Frank Child Development Center, 6639 N. Kedzie Ave., Chicago. jcfs.org. STROLLER GROOVES. Chicago Architecture Center, 111 E. Upper Wacker Drive, Chicago. architecture.org. MORNING GLORIES. The series showcases premier local talent who specialize in music arrangements for younger audiences, ideal for toddlers and young children. Noon-1 p.m. Tuesdays. Navy Pier, 600 E. Grand Ave., Chicago. (312) 595-PIER (7437), navypier.com. ARBOR READING ADVENTURES. Interactive story time and fun crafts indoors before heading out on the grounds for an adventure walk. Themes change each week. $5. 1111:45 a.m. Wednesdays & Fridays. The Morton Arboretum, 4100 Illinois Route 53, Lisle. (630) 968-0074, mortonarb.org. ing of “Twenty-One Elephants” by April Jones Prince, build a bridge from a variety of wacky supplies, and then test how much weight it can hold. Recommended for ages 3-6. $12, free for members. 10-11:30 a.m. & 1-2:30 p.m. Wednesdays. Chicago Architecture Center, 111 E. Upper Wacker Drive, Chicago. architecture.org. WILD WEDNESDAYS. hether you’ve seen “Hamilton” five times at the CIBC Theatre or are still waiting for your name to be drawn in the lottery, there’s still more to know about the story of Founding Father Alexander Hamilton. In a traveling exhibition that will make its debut April 27 on Northerly Island, the production team behind the Broadway and touring musical, “Hamilton,” has created a continuing story that lets fans and history buffs into the life and times of America’s first Secretary of Treasury. ONGOING EVENTS exploring the playful side of architecture. $12, free members. Noon Thursdays. Chicago Architecture Center, 111 E. Upper Wacker Drive, Chicago, architecture.org. performances and more. $14.95 for up to four people, $5 each additional person. 4-8 p.m. Thursdays. Chicago Children’s Museum, 700 E. Grand Ave. at Navy Pier, Chicago. (312) 5271000, chicagochildrensmuseum.org. Parents and young children can enjoy Chicago’s best music, dance and theater in a kid-friendly setting. Parents are welcome to bring snacks and juiceboxes. 11-11:45 a.m. cityofchicago.org/specialevents. formance series for the stroller set. Performances are on the first and third Friday at the Chicago Cultural Center and first and third Saturday at Garfield Park Conservatory. servatory each weekend for activities and projects that get kids and families wondering about the plants and the natural world. Each week will be a different science-based activity. Noon-4 p.m. Saturdays & Sundays. Garfield Park Conservatory, 300 N. Central Park Ave., Chicago. (773) 638-1766, garfieldconservatory.org. LITTLE SQUIRRELS STORYTIME. Stories and songs celebrating classic literature for preschool-age kids. Free with admission. 10:30-11:30 a.m. Saturdays. American Writers Museum, 180 N. Michigan, 2nd Floor, Chicago. (312) 374-8790, americanwritersmuseum.org. must bring their own flashlight. $2. 8-10 p.m. April 12. Sheridan Park, 910 S. Aberdeen St. (773) 478-2889, chicagoparkdistrict.com. egg hunt, arts & crafts projects, face painting and egg races. Recommended for ages 3-12. 11 a.m.-3 p.m. April 13. Palmer Park, 201 E. 111th St. (312) 747-6576, chicagoparkdistrict.com. EGG HUNT. Event includes egg hunt, face painting, petting zoo, inflatables and games. Refreshments sold separately. Recommended for ages 3-12. $10. 10:30 a.m.-12:30 p.m. April 13. Armour Square Park, 3309 S. Shields Ave. (312) 747-6012, chicagoparkdistrict.com. EGG HUNT. Enjoy a “Hide Nor Hare” egg hunt. Recommended for ages 3-12. 11 a.m.-1 p.m. April 13. Bessemer Park, 8930 S. Muskegon Ave. (312) 747-6023, chicagoparkdistrict.com. 3-12. 11 a.m.-1 p.m. April 13. West Lawn Park, 4233 W. 65th St. chicagoparkdistrict.com. weekend celebration including photos with the Easter Bunny, multiple egg hunt waves for different age groups, music, crafts and complimentary rides on the AT&T Endangered Species Carousel and more. $20 ages 1 and older ($18 members). 8 a.m.-12:30 p.m. April 20. Lincoln Park Zoo, 2200 N. Cannon Drive, Chicago. (312) 7422000, lpzoo.org. BUNNY ROCK 5K & EGG HUNT. FLASHLIGHT EGG HUNT AT KILBOURN. Bring a flashlight. $5. family for an egg hunt, arts and crafts, games and more. $2. 1-3:30 p.m. Brainerd Park, 1246 W. 92nd St. (312) 747-6027, chicagoparkdistrict.com. EGG HUNTS $10-$20 egg hunt. 9 a.m. race; 10:15 a.m. egg hunt April 20. Montrose Harbor, Montrose and Montrose Harbor drives. (312) 7427527, bunnyrock5k.com. basket. Recommended for ages 3-8. $5, registration required. 9:30 a.m.-noon (hunt times vary by age) April 13. RecPlex Mount Prospect, 420 Dempster St., Mount Prospect. mppd.org. preregistration; Free adults & children under 2. 10 a.m.-1 p.m. April 13. Community Recreation Center, 505 N. Springinsguth Road, Schaumburg. (847) 490-7020, parkfun.com. 10 and under hunt throughout the museum grounds. $6; registration required. 10-12:45 a.m. April 13. Arlington Heights Historical Museum, 110-112 W. Fremont St., Arlington Heights. (847) 255-1225, ahmuseum.org. Dye eggs using natural, plant-based dyes, decorate a spring basket and hunt for eggs in a wooded setting. Recommended for ages 3 and older. $20, $15 residents. 10-11:30 a.m. April 13. Spring Valley Nature Center & Heritage Farm, 1111 E. Schaumburg Road, Schaumburg. (847) 985-2100, parkfun.com. BUNNY BASH (SCHAUMBURG). Evenings and Saturdays available. Practice limited to infants, children and adolescents. EGG HUNTS for ages 4 and up. One adult required for every two children. $2, does not include museum admission; $1 members; free adults. 11 a.m.-3:30 p.m. April 19. Discovery Center Museum, 711 N. Main St., Rockford. (815) 963-6769, discoverycentermuseum.org. a dozen hard-boiled eggs; all egg decorating supplies will be provided. While the eggs dry, participants enjoy a flashlight egg hunt in Safety Park (weather permitting). Recommended for ages 1-14. $9, $7 residents, pre-registration is recommended. 6:45-7:45 p.m. April 17. Schaumburg Park District, 505 N. Springinsguth Road, Schaumburg. (847) 490-7020, parkfun.com. with toys and surprises. 10 a.m.noon April 20. Sunset Woods Park, 1801 Sunset Road, Highland Park. (847) 579-3120, pdhp.org. Springinsguth Road, Schaumburg. (847) 490-7020, parkfun.com. egg hunts, entertainment, games and prizes. Scheduled egg hunts by age group will be in the play pool. Children must be accompanied by an adult at all times. $18, $12 resident; free adults. 6-8 p.m. April 18. Schaumburg Park District, 505 N.
buffet and then take a walk over to the Bunny Patch, where kids can do crafts, activities and take a photo with the bunny. $16.95, $7.95 kids 23 months and under for activities. Nichols Hall. Bring a basket and hop to the Rose Garden after brunch and join in the Easter egg hunt. $40, $35 member; $30 kids 3-12, $25 member kids; free kids 2 and under. Seatings at 9 a.m., 10 a.m., 11 a.m., noon and 1 p.m. April 21. Chicago Botanic Garden, 1000 Lake Cook Road, Glencoe. (847) 835-5440, chicagobotanic.org. We take the fear out of dentistry for your child. Deena F. Leonard, M.D. Dana L. Kolton, M.D. Kathy Anderson, M.D. eat buffet, held at Brookfield Zooâ&#x20AC;&#x2122;s Discovery Center, will feature a special appearance from costumed characters Mr. and Mrs. Bunny. There will be live musical entertainment. Advance reservations recommended. $29.95 adults; $21.95 children (3-11); free kids 2 and under. 9 or 11 a.m. April 13-14 & 20. Brookfield Zoo, 8400 31st St., Brookfield. (708) 688-8000, czs.org. EASTER EGG OPEN HOUSE AT CANTIGNY PARK (WHEATON). 2-10 will be divided into groups according to age and will hunt for hundreds of candy- and sticker-filled eggs. 10-10:10 a.m.; arrive early April 13. The Depot, 400 Thatcher Ave., River Forest. rfparks.com. access to the zoo. Kids will be divided into age groups for the egg dash portion. $13.50 kids 2-10, $5 ages 11 and up, free kids under 2. 5-6:30 p.m. April 13. Cosley Zoo, 1356 Gary Ave., Wheaton. (630) 665-5534, cosleyzoo.org. Parents must be present with their children, but may not assist. Preregistration is required. $16, $11 resident 7:30-8:15 p.m. April 18. Knoch Knolls Park, 336 Knoch Knolls Road, Naperville. (630) 848-5000, napervilleparks.org. FLASHLIGHT EGG HUNT IN WILDER PARK (ELMHURST). prize-filled eggs under the stars. Refreshments will be served. Bring a flashlight and a bag or basket. Kids 11-16 search for prize eggs. Bring a flashlight and a basket. 8-8:30 p.m. April 18. Wilder Park. We listen carefully, test, and treat the cause. Our team is specialized in the evaluation of sight and visual skills for children of all levels of functioning. We determine the need for glasses, identify tracking issues, and evaluate visual processing abilities in a fun and child friendly environment. When appropriate, lenses, prisms, filters, and/or vision therapy may be prescribed. Drs. Margolis, Lederer and Chan and their team will be happy to meet your child in their familyoriented clinic located in Arlington Heights. Call us today at (847) 255-1040. George Lin, D.D.S. Anjali Talati, D.M.D. Ask about our NO SHOT & NO DRILL Laser fillings! tion’s Large st Ed The Na uca tiona l Reptile and Amphibian Show! 6 can enjoy a crazy egg hunt with a chance to meet the Easter Bunny. $9, $6 resident; preregistration required. 9:30 a.m.-noon April 19. Glen Ellyn Park District, 185 Spring Ave., Glen Ellyn. (630) 858-2462, gepark.org. EGG HUNT (BERWYN). for eggs and visit with the Easter Bunny. Bring your camera and a basket. Easter egg hunt for dogs begins at 10:30 a.m. Dogs must be leashed, wearing current rabies tags, and accompanied by an adult 16 years or older. Prizes will be awarded for best pup in costume. 10 a.m. April 20. Wilder Park, 175 S. Prospect Ave., Elmhurst. (630) 739-1071, epd.org. eggs have been hidden in the forest. $15, $10 residents; preregistration required. 7:30-8:30 p.m. April 12.
from the chicken coop, ride a horse, visit the newborn animals and meet the Easter Bunny. Advance tickets required. $24, free adults. 10 a.m.-3 p.m. April 20. The Children’s Farm at The Center, 12700 Southwest Highway, Palos Park. (708) 3613650, thecenterpalos.org. AMERICAN GIRL LIVE. Join your favorite American Girl characters and the campers as they follow their hearts, share their dreams and learn the power of friendship at a sleepover camp. $39+. Begins April 30. Broadway Playhouse at Water Tower Place, 175 E. Chestnut St., Chicago. (800) 775-2000, broadwayinchicago.com. AUGUST RUSH. The musical tells the story of Evan Taylor, an 11-yearold orphan who believes in music like some believe in fairytales. Evan has not given up hope as he relentlessly searches for the parents he knows need him. $36-$69. Begins April 24. Paramount Arts Centre and Theatre, 23 E. Galena Blvd., Aurora. (630) 896-6666, paramountaurora.com. audience from the twilight of the Russian Empire to the euphoria of Paris in the 1920s. Pursued by a ruthless Soviet officer, Anya enlists the aid of a dashing conman and a lovable ex-aristocrat. Together, they embark on an epic adventure to help her find home, love and family. $27+. 7:30 p.m. TuesdayFriday & Sunday, 2 p.m. SaturdaySunday, 8 p.m. Saturdays through April 7. James M. Nederlander Theatre, 24 W. Randolph St., Chicago. (800) 775-2000, broadwayinchicago.com. Spanish speakers who can speak English. $9. 10 a.m. April 2, April 9, April 25 & April 29. Bilingual performances April 3 & April 10. The Miracle Center, 2311 N. Pulaski Road, Chicago. teatrovista.org. Grandma. This show is recommended for children ages 2 to 10. $14. 10:30 a.m. WednesdaysFridays. Stahl Family Theater, 5900 W. Belmont Ave., Chicago. (773) 286-8470, stpatrick.org. DATES AND CAST SUBJECT TO CHANGE. STARS ON ICE AND LOGO ARE REGISTERED TRADEMARKS OF INTERNATIONAL MERCHANDISING COMPANY, LLC. ©2019 ALL RIGHTS RESERVED. story. Doors open at 2:30 p.m. with coloring, crafts, board games and dress-up fun for kids on the stage. $17.50-$26.50. 3 p.m. Sundays through April 7. Under The Gun Theater, 956 W. Newport Ave., Chicago. (773) 270-2440, greateststorynevertold.org. LOVE, CHAOS, AND DINNER. Teatro ZinZanni is a whirlwind of international cirque, comedy and cabaret served with a multi-course feast. Described as the “Kit Kat Klub on acid,” the fast-paced action unfolds around, above and alongside guests as world-class acrobats, musicians, divas, illusionists, madmen and aerialists fill the intimate Spiegeltent ZaZou, a unique jewel box mirror tent. $123 and up, includes fourcourse meal. 7 p.m. WednesdaysSundays, noon Saturdays & Sundays beginning April 5. The Cambria Hotel Loop-Theatre District, 32 W. Randolph St., Chicago. broadwayinchicago.com. JAMES AND THE GIANT PEACH. PERFORMANCES insects with equally oversized personalities. Recommended for ages 4-10. $8.50. 10:30 a.m. April 3-5. Prairie Lakes Community Center, 515 E. Thacker St., Des Plaines. (847) 391-5711, absproductions.com. for grades K-3. $12 students, $14 adults. 10 a.m. Monday-Friday, April 2-12. Metropolis Performing Arts Centre, 111 W. Campbell St., Arlington Heights. (847) 577-2121, metropolisarts.com. p.m. Thursdays-Saturdays, 3 p.m. Saturdays, 2 p.m. & 6 p.m. Sundays beginning April 26. Drury Lane Theater Oakbrook Terrace, 100 Drury Lane, Oakbrook Terrace. (630) 530-0111, drurylaneoakbrook.com. JERSEY BOYS. Go behind the music and inside the story of Frankie Valli and The Four Seasons in the Tony Award-winning true-life musical phenomenon. From the streets of New Jersey to the Rock and Roll Hall of Fame, this is the musical that’s just too good to be true. $30+ 7:30 p.m. Tuesday-Friday, 8 p.m. Saturday, 2 p.m. Saturday-Sunday, April 2-7. Auditorium Theatre of Roosevelt University, 50 E. Ida B. Wells Drive, Chicago. (312) 9222110, auditoriumtheatre.org. LITTLE SHOP OF HORRORS. The sci-fi musical follows the story of a floral assistant who stumbles across a new breed of carnivorous plant that promises to grant him fame, fortune and all his desires—as long as the blood keeps flowing. $35$65. 8 p.m. Wednesdays-Fridays, 5 p.m. & 8:30 p.m. Saturdays and 3 p.m. Sundays through April 28. Mercury Theater, 3745 N. Southport, Chicago. (773) 3251700, mercurytheaterchicago.com. PINOCCHIO. Carved from an enchanted stump in a charred forest, toyshop owner Geppeto’s small puppet child flourishes. But his protective father forbids Pinocchio from venturing outside. Pinocchio will be portrayed by a Bunraku-style puppet, created and crafted by Tom Lee of Chicago Puppet Studios. Recommended for ages 11 and older. $30+. 8 p.m. Thursdays-Saturdays & 3 p.m. Sundays. Chopin Theatre, 1543 W. Division St., Chicago. (773) 278-1500, chopintheatre.com. Hollywood’s Sunset Strip when a small-town girl meets a big city rocker. As they fall in love in L.A.’s most famous rock club, “Rock of Ages” allows fans to rock out once again to their favorite ’80s hits. Summer camps and classes at The Little Gym allow kids to exercise their muscles and imaginations! Our flexible camp scheduling allows you to sign up by the week or day! A bear. A button. A place to belong. at Athenaeum Theatre, 2936 N Southport Ave, Chicago Tickets start at $20 at EmeraldCityTheatre.com or through the Athenaeum Theatre box office at 773.935.6875. PERFORMANCES coin that Sean’s great uncle received from a magician at Chicago’s Columbian Exposition of 1893. $16 ages 7 and older, $20 adults. 2 p.m. Saturdays through April 27. Theater Wit, 1229 W. Belmont, Chicago. (773) 975-8150, theaterwit.org. much more than they bargained for. Good for ages 9 and up. $20-$45 10:30 a.m. & 12:30 p.m. Saturdays and Sundays and 3 p.m. Saturdays through April 28. The Station, 100 S. Racine Ave., Chicago. chicagochildrenstheatre.org. National Ballet Company gives the Midwest premiere of Alexei Ratmansky’s Whipped Cream. This whimsical ballet follows a young boy after he overindulges in sweets and falls into a sugar-induced delirium. Set to a 1924 score by Richard Strauss and featuring Photo by Ralf-Brinkhoff colorful costumes and jubilant sets by pop-surrealist artist Mark Ryden, the ballet is appropriate for the whole family. Visit website for ticket prices. 7:30 p.m. April 11; 11 a.m. (one-hour student performance) & 7:30 p.m. April 12; 2 p.m. & 7:30 p.m. April 13; 2 p.m. April 14. Auditorium Theatre of Roosevelt University, 50 E. Ida B. Wells Drive, Chicago. (312) 9222110, auditoriumtheatre.org. Birthday party packages available at a Classic Cinemas near you CHECK OUT THESE UPCOMING TITLES! Our company is expanding... call now and learn more! Your Families Matter. Your Opinions Matter. Earn Cash For Having Both! Participate in market research discussions on infant products from major manufacturers. You’ll receive generous monetary compensation for your valuable consumer opinions. Chicago Parent needs a few good moms and dads. We are looking for friendly, outgoing readers to staff Chicago Parent booths at events throughout the city and suburbs. Must have a car and flexible schedule. Events are mainly on weekends. Turn an egg carton into bright little chicks PHOTOS AND STORY BY MEGAN MURRAY ELSENER hether you are looking for a craft for Easter, spring, Earth Day or just a rainy afternoon, these little egg carton chicks are the perfect go-to. With materials you likely have sitting around the house, bring these spring chicks to life while reusing something old to make something new. Find an empty egg cartonâ&#x20AC;&#x201D;either cardboard or plastic cartons will work. Cut apart two egg holders from the carton. Trim off any extra edges so they will fit with one on top of the other. Glue the two pieces together. Once the glue is dried, use acrylic paint to paint the entire body of the chick. Let dry. With construction paper, cut a diamond shape and bend in half. Attach with glue to create a beak. Use a black Sharpie, paint or even googly eyes to make two eyes on the chick. If desired, add a feather on top. New ABA New ABA Center New ABA Therapy Therapy Center Therapy ComingCenter to Coming Coming toto Lakeview! Outcomes-focused therapy, Outcomes-focusedtherapy, therapy, Outcomes-focused designed to help your child designed help your child designed totohelp your child achieve more in in less time. achieve more inless less time. achieve more time. Lakeview! Lakeview! Opening Soon! Opening Opening in in March! March! At Autism Home Support Services, we can help your child overcome the Autism Home Support Services, can help your child overcome the AtAt Autism Home Support Services, wewe can help your child overcome the behavioral challenges that holding them back. behavioral challenges that may bemay holding them back. behavioral challenges that may bebe holding them back. Our therapists provide customized therapy for individuals with autism Our therapists provide customized therapy individuals with autism Our therapists provide customized therapy for for individuals with autism and related disorders. Our outcomes-focused model can create a positive and related disorders. Our outcomes-focused model cancreate createaapositive positive and related disorders. Our outcomes-focused model can difference in your child’s overall development and long-term success using difference your child’s overall development long-term success byby using difference in yourinchild’s overall development andand long-term success by using the evidence-based practices Applied Behavior Analysis (ABA) therapy. the evidence-based practices ofof Applied Behavior Analysis (ABA) therapy. the evidence-based practices of Applied Behavior Analysis (ABA) therapy. prekindergarten, concentrating on the process through which children learn. Discovery-based play expands imagination, encourages sense of wonder, and provides a diverse and comprehensive foundation for cognitive, social, emotional and creative growth. Check out our big birthday party planner, Celebrations, and our home issue this month.